Ordinary number signatures Sommai-Nukool UNC about 3,800 baht. Solid number xxxxxxx signatures Sommai-Pisoot UNC about 5,600 baht. 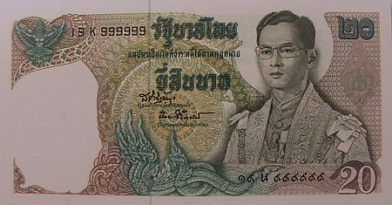 Solid number 8888888 signatures Sommai-Pisoot UNC about 12,500 baht. 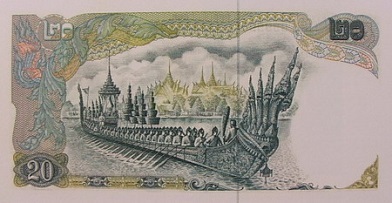 This 20 baht banknote was issued on June 9th, 1971. The main color of the banknote is green. The main object is the image of King Rama 9 in full regalia. The main object is the image of the Anandanakaraj royal barge.